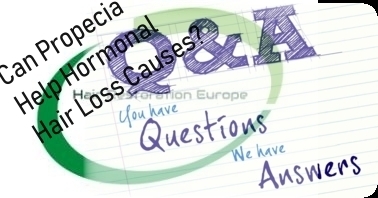 Question: Can Propecia Stop Hair Loss Caused by a Thyroid or Hormonal Problem? Male pattern hair loss is due to the formation of dihydrotestosterone (DHT). Effecting the genetically predisposed hair follicles generally over the top of the scalp. DHT causes increased hair shedding. The gradual miniaturisation or thinning of the hair. This eventually results in permanent hair loss. Propecia works by inhibiting 5-alpha-reductase enzymes, that when combined with testosterone, create DHT, (dihydrotestosterone). The hormone responsible for male pattern baldness. The thyroid regulates many aspects of health through the use of hormones. The two most common forms of thyroid disease are hypothyroidism and hyperthyroidism. Hair loss caused by a thyroid condition or other hormonal issues have nothing to do with DHT induced genetic hair loss. Propecia or Finasteride won’t stop this type of hair loss. Non-genetic hair loss is often reversible by working with a physician to correct what’s causing it. Be sure to speak to your physician about proper treatments to thyroid or hormonal problems.